Formula One world champion Lewis Hamilton took pole position for the season-opening Australian Grand Prix on Saturday ahead of Mercedes team mate Nico Rosberg as the Silver Arrows continued to underline their dominance. The Briton recorded a fastest lap of one minute 26.327 seconds, nearly six-tenths quicker than Rosberg to capture his 39th pole on a warm and windy afternoon at Albert Park. "I feel incredibly blessed to have this car. 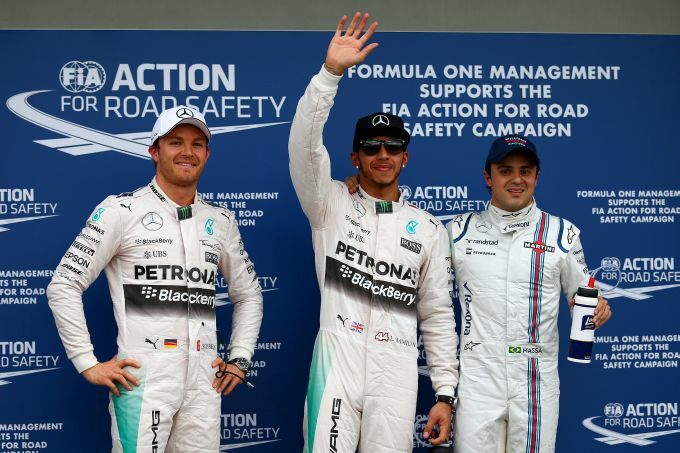 It's so much fun in qualifying," Hamilton told reporters. Williams driver Felipe Massa qualified third ahead of Sebastian Vettel on debut for Ferrari. McLaren's dismal winter testing has followed them Down Under and Jenson Button and Kevin Magnussen will line up from the back of the grid after failing to be in the top 15 cars that advanced to the second qualifying session. Though the sessions produced no major incidents, team radios blared throughout as drivers reported a myriad technical problems and occasionally skidded off track. Australian Daniel Ricciardo complained from the outset that his Red Bull lacked power and will line up seventh on the grid behind Ferrari's fifth-placed Kimi Raikkonen and Valterri Bottas in the other Williams. Ricciardo's team mate Daniil Kvyat was knocked out in the second round of qualifying and will line up 13th. Having fought legal battles with Giedo van der Garde all week, Sauber's nominated drivers Marcus Ericsson and Felipe Nasr entered qualifying after the Dutchman elected not to pursue his racing seat at Albert Park. Ericsson was among the three eliminated in Q1 and will start 16th on the grid in front of the McLarens with his Brazilian team mate five spots ahead. Only 18 cars will compete in Sunday's race after Manor Marussia were unable to put Spaniard Roberto Merhi and Briton Will Stevens on the track for either qualifying or any of the three practice sessions.